"Antonio" redirects here. For the namesake outfit in GTA Liberty City Stories, see Antonio (outfit). You may also be looking for Toni, the DJ of Flashback 95.6 in GTA III and Flash FM in GTA Vice City and GTA Vice City Stories. Antonio Cipriani, also referred to as Toni or Anthony, is a recurring character in the 3D Universe who appears as the protagonist of Grand Theft Auto: Liberty City Stories and a main character in Grand Theft Auto III. He is a made man in the Leone Family, the main Mafia family in Liberty City and also helps run his mother's restaurant in Saint Mark's, Portland, Liberty City. 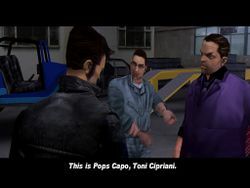 Cipriani is voiced by Michael Madsen in GTA III and by Daniel Mastrogiorgio in GTA Liberty City Stories. Antonio "Toni" Cipriani was born to Ma Cipriani and an unnamed father, a member of one of the city's Mafia families, in Portland, Liberty City. He lived with his parents in their home and restaurant located in the Saint Mark's neighbourhood. Cipriani grew up in a Mafia controlled neighbourhood and later became involved in the criminal underworld before joining the Leone Family. In 1994 Toni killed a made man on orders from Salvatore Leone, Don of the Leone Family, and left Liberty City for an unknown destination. Toni returned to Liberty City on a coach in 1998 and immediately met a grateful Salvatore who immediately places him under the leadership of made man Vincenzo Cilli who rose through the family's hierarchy during Toni's abscene. Toni initially finds himself performing menial tasks for Cilli, including taking a drug dealer to his turf but is later asked to do more troublesome tasks, including assisting robbers escape from the AmCo petrol station. Toni, however, is later set up by Vincenzo when collecting a car loaded with drugs being watched by the police. Toni, angry and ashamed at working for Vincenzo, is entrusted with working for Joseph Daniel O'Toole, a member of the rival Sindacco Family who wants to join the Leones. While working for O'Toole, Toni manages to impress Salvatore by driving him away from Paulie's Revue Bar, which was being raided by the police, by preventing the destruction of a Leone-controlled casino and then, in retaliation, destroying the Sindacco run Dolls House casino/bordello. Toni later worked for Salvatore, doing various tasks to attempt to convince union leader Jane Hopper and her fellow union leaders to grant them access to the harbor during planned strikes, which had been funded by Salvatore. During this time he also begins to work for Salvatore's wife, Maria Latore, constantly rescuing her from danger when shop lifting, being kidnapped, illegal street racing, an aggressive love interest named Wayne, who he later kills, and from overdosing on drugs. Maria, during this time, begins to fall in love with Toni but, realizing he has no money, reaffirms her interest in Salvatore's money. Toni also confronts his mother for the first time in four years following his hasty departure. His mother, disappointed in his lack of phone calls while in hiding, continually makes negative remarks about his character and appearance, claiming he is too thin. Toni, in attempts to impress his mother, takes photographs of Giovanni Casa in his underwear and chasing two prostitutes (including Mona Lott) and later killing him when he stopped paying protection money, wins an illegal street race and kills Dan Sucho, as well as killing many Triads. His attempts, however, fall short of her high expectations following her husbands example and she places a hit on Toni, asking him to die 'like a real man'. Toni Cipriani, about to become a made man, talking to the Don of the Leone Family, Salvatore Leone, as Mickey Hamfists looks on. Toni, after escaping from hitmen and the interests of Maria, returns to Salvatore and is sent to collect some drugs from Miguel of the Colombian Cartel. Their deal is ambushed by the police but Toni manages to retrieve the drugs and kill Miguel before returning to Salvatore. A short while later he receives a phone call from O'Toole who informs him that Salvatore has been kidnapped by some Sindaccos although their attempts are thwarted when Toni rescues him and later helps Salvatore exact his revenge on the Sindaccos. Salvatore later has Toni follow Massimo Torini of the Sicilian Mafia, from which they learn of his treacherous alliances with the Triads and Diablos, before joining Mickey Hamfists in driving O'Toole to be 'made'. O'Toole, however, is killed by Hamfists and Toni disposes of the body in the sea before receiving a phone call from Vincenzo, wanting to make peace at Salvatore's request. Toni, upon entering a freighter, is attacked by various men with chainsaws but survives, managing to kill Vincenzo in the process. Toni later helps to repel the Diablos from Hepburn Heights and the Red Light District and retrieves some money from a warehouse in Callahan Point, which had been destroyed by the Triads. The Mayor Roger C. Hole, alligned with the Forelli Family, puts out an arrest warrant for Salvatore who, along with Toni, is forced to flee to a safehouse in Newport, Staunton Island. This occurs, however, only after an argument over comments Toni had supposedly made about Salvatore and his intelligence. The argument involves Salvatore pointing a gun at Toni before realising his loyalty and admitting to becoming increasingly paranoid. Salvatore, in retaliation at the Mayors actions, has Toni kill the Mayor on his jog in Belleville Park, retrieveing his phone in the process. For this, his work for the Leone Family and twice rescuing Salvatore he is made despite his concerns following O'Toole's 'ceremony'. Toni, after being made, receives a phone call from his mother informing him that she had called off the hit but complains that she should not have had to go to sucuh lengths to force his upward movement in the family hierarchy. Toni then comes under the employment of Donald Love, a rich businessman and Salvatore's preferred candidate to become Mayor. After collecting a corpse for a party Toni begins to campaign for Love and kill some of his rivals campaigners. Toni later also destroys a Forelli owned printing company that had been printing ballot papers, protects Love while he campaigns and, with the vote too close to call, steals a number of the ballot papers to replace with votes for Love. Their efforts, however, fall through as Love's connections with the Leone Family persuade voters to elect Miles O'Donovan. Love, now bankrupt, disppears. Toni, during this time, had also helped Salvatore confirm Hole's allegiance to the Forelli Family and rescue Salvatore when he found himself in the middle of a hit during an attempt to spy of the Forellis. A peace deal between the Forelli and Sindacco families is also ruined by Toni, who also kills a wiseguy who was heading to Forelli Don Franco Forelli to inform him of Massimo Torini's plans to take control of the city. The Sindacco Family were also targetted at this time when Toni began to work for corrupt police officer Leon McAffrey, which included killing a number of Sindacco mobsters, helping the Uptown Yardies acquire and then maintain control of Newport. McAffrey also told Toni of the Forelli Family's plans to move their weapons to another location, which Toni stopped by destroying them. A free Salvatore Leone talking to Toni Cipriani after being released from police custody. During this time Salvatore Leone is arrested and placed in prison on Shoreside Vale. While awaiting trial he visited by Toni, disguised as a lawyer named Lionel, and is told to attack the Forelli and Sindacco families for his incarceration. Toni assists the Southside Hoods in taking control of Wichita Gardens, a Forelli neighbourhood, and then kills Sindacco Don Paulie Sindacco, before attacking a Yakuza weapons storage and destroying their tank. He later meets Toshiko Kasen, the bitter wife of Yakuza leader Kazuki Kasen, who hires Toni to slowly destroy her husband, including destroying his money and going to the opera with Toshiko, before killing Kazuki on the roof of his casino. He also meets Donald Love in a Shoreside Vale flophouse during this time and helps him lill his old mentor Avery Carrington to acquire his plans to regenerate the city and kill Liberty Tree reporter Ned Burner who had taken photographs of Avery's murder. Toni, had previously worked for Burner when he pretended to be the vicar at the city cathedral and knew him to be the chief reporter for the Liberty Tree newspaper. He later chases him down and collects the photographs before killing Burner after he tried to escape and after he published stories about Toni's criminal activities under his instructions. The corpses of Avery and Ned are later collected for another morgue party. Love has Toni meet explosives expert 8-Ball who provides him with a van laiden with explosives, which he plants in old subway tunnels under Fort Staunton, a Forelli turf, before detonating them causing the area to be completely destroyed, allowing Love to rebuild the area. Toni also later helps Love escape the attention of the Colombian Cartel, Avery's partners, and he flees on his private aeroplane. Shortly after Salvatore is escorted to his arraignment by Toni who kills a number of Sicilian Mafia mobsters attempting to murder Salvatore before helping him end the Sicilians plans of taking over the city by killing their underboss Massimo Torini and 'persuading' the Mayor, Miles O'Donovan, to work for the Leone Family. Toni continued to work for Salvatore Leone and the Leone Family but became less active in the actual criminal activity. During this time he also moved back in with his mother and her restaurant, which he also became more active in running. He put weight on during this time and began to have a shorter temper, likely due to his mothers constant disapproval of him, and is known to have punched a man for claiming the ziti at the restaurant was over-baked. He also comes under investigation by the police for his links to Salvatore Leone, although Toni maintains that he only purchases tomato sauce from him. He also manages, throughout the period, to establish himself as the right hand man of Salvatore, being placed above Salvatore's own son Joey Leone. Joey Leone introducing Claude to Toni Cipriani during the mission Cipriani's Chauffeur. In 2001 Toni continues to work for Salvatore Leone and help his mother run her restaurant. He is introduced to Claude, a man capable of completing tasks similar to Toni three years previously, and he hires him after using him as a driver when attempting to collect his protection money from Mr. Wong's Laundromat. Toni later has Claude retrieve the protection money, which is ambushed by the Portland Triads, destroy three Triad vans, kill three Triad warlords, and then destroy the Belly-Up Fish & Seafood Processing Plant. He also introduces Claude to Salvatore, who is shown to hold a high opinion of him. Toni also phones in to Chatterbox FM and complains to the shows host Lazlow about his mother, her unrealistic expectations and continual negativity towards him and his character. Toni's behavior changes somewhat throughout his appearances. In 1998, Toni is somewhat easy-going, although very business-oriented and has somewhat of a control of his temper. By 2001, his mother's endless harshness had given him an explosive temper and a very short fuse. Although short-tempered and aggressive, Toni rarely gets angry at his mother, despite her constant insults, and does everything he can to please her. Likewise, Toni has great respect for Salvatore Leone and is extremely loyal to him. Toni is also known for making unfortunate choices, due to his hot temper. Toni also has a darker side. Somewhat similar to Tommy Vercetti, when enraged, Toni gets extremely violent like when he kills and brutally dismembers Giovanni Casa and sells his cut-up body to Casa's deli. He also seems generally unfazed by the disastrous attack he performed on Fort Staunton. Despite this, Toni is capable of remorse as he is known to attend church to atone for his deeds. 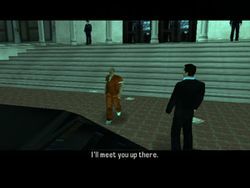 Toni Cipriani in GTA III. Toni Cipriani in GTA Liberty City Stories. Toni Cipriani ages significantly in the three years between Grand Theft Auto: Liberty City Stories and Grand Theft Auto III, gaining streaks of silver in his hair and also putting on weight after being called thin by his mother, Maria Latore and Salvatore Leone. Toni Cipriani is likely homage of Tony Soprano, the main character from The Sopranos. Aside from their names, both characters also share ongoing problems with their mothers, who also ordered hits on them (which occur to Toni in GTA: Liberty City Stories). Early GTA III game art for Cipriani, however, depicts him bearing a likeness to Joe Pesci. An Easter egg in Grand Theft Auto IV suggests that Toni Cipriani died after 2001. However, this is not been considered canon with the GTA III Era. The surname 'Cipriani' is a possible reference to the Itailian dish occupying the same name. Toni Cipriani's appearance changes in between cutscenes and his in-game appearance in GTA Liberty City Stories. In the cutscenes his upper body is more downward a bit chubby, but in the in-game appearance he is shape more muscular. Until Trevor Philips, Toni Cipriani was the only protagonist who deliberately dismembered a person without the player's control. Toni Cipriani is also the only protagonist who worked for Salvatore Leone who did not turn his back on him. Carl Johnson ended up robbing Caligula's Palace and Claude ended up killing Salvatore. Toni, Michael De Santa, and Trevor Phillips are the only protagonists to directly come in contact with Lazlow. Toni calls Chatterbox FM and speaks with Lazlow in Grand Theft Auto III, while Michael and Trevor actually confront him in person and chase him after he inapproprietly touches Tracey De Santa on Fame or Shame. 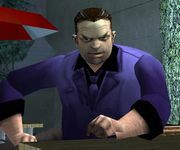 A pre-release image of Toni Cipriani in GTA III. 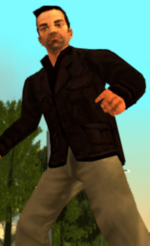 Game artwork of Toni Cipriani in GTA III. 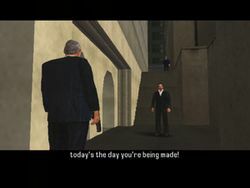 Toni Cipriani shortly after returning to Liberty City in the introductory cutscene in GTA LCS. This page was last modified on 17 May 2015, at 04:12.